UDA offers the option to download Construction Office and ConstructionBasics Software components on all online orders. After entering your credit card information, you will receive the option to download the software at that time. Whether you choose to download the software or not, we will still ship the software package on CD-Rom or disk with a full Reference Guide and registration cards as you have requested. Most Orders are shipped Airborne Express or Priority Mail. Check the UDA Price Index for specific shipping costs and options. Most Orders placed by 12:00 pm Eastern Time (4:00 pm EST for Construction Office Software) will be processed, inspected and shipped the same day. 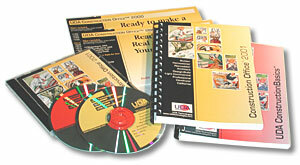 UDA Construction Office and ConstructionBasics Software comes with a 10-Day Money Back Satisfaction Guarantee. Returns must be 100 percent complete, in original and resalable condition, with all packaging, manuals, registration cards and software. Shipping charges are not refundable. Prior to shipping your return, please call UDA Customer Service for a Return Authorization Code. For Ideal Home Plans, Accessible Plans and Duplex Plans we will gladly exchange blueprint sets of plans within 30 days of the purchase date, or credit the purchase price towards UDA Custom Architectural Services or Plan Modifications. Please note that a handling fee will be assessed for all exchanges. Reproducible Sets and CAD Files of Ideal Home Plans, Accessible Plans and Duplex Plans cannot be exchanged or returned. All UDA Custom Design Services and Plan Modifications are non-refundable. In the unlikely event you receive a shipment with incorrect merchandise, please contact a UDA Customer Service Representative and we will promptly see that the items are retrieved and reshipped, at no cost to you. Complete UDA Plan Services End User License Agreement. If you receive a damaged item, sign the receipt and write "Damaged" next to your signature. If you suspect the package is damaged but have not yet opened it, ask the delivery person to give you an opportunity to physically inspect the package in their presence. If that is not possible, save the carton and all packing materials for inspection by the shipping company. In any case, please contact a UDA Customer Service Representative and we will reship your order and resolve the situation as soon as possible. Most UDA Products are available for next day Delivery if the order is placed by 12:00 pm Eastern Time (4:00 pm EST for Construction Office and ConstructionBasics Software) . In the unlikely event that an item you wish to order is out of stock or temporarily unavailable, we will notify you in writing, phone, or e-mail. Unless you tell us otherwise, we will ship your ordered item as soon as possible. If we will not be able to ship an item within 10 days from receipt of your paid order, you may request a refund (except Special Order or Custom Services). UDA Ideal Home Plans are designed to comply with the National Building Code as administered by the SBCCI. However, due to varying requirements, it is the responsibility of the purchaser to verify compliance with all applicable National, State and Local Building Codes. All information, plans and specifications is provided "as is" without expressed or implied warranty, including, but not limited to, the implied warranties of merchantability, fitness for a particular purpose, or non-infringement. UDA assumes no responsibility for errors or omissions in these pages or other documents which are referenced by or linked to these web pages. References to corporations, services and products, are provided "as is" without warranty of any kind, either expressed or implied. In no event shall UDA be liable for any special, incidental, indirect or consequential damages of any kind, or any damages whatsoever, including, without limitation, those resulting from loss of use, data or profits, whether or not advised of the possibilities of damage, and on any theory of liability arising out of or in connection with the use or performance of the information. These documents could include technical or other inaccuracies or typographical errors. UDA assumes no liability for errors or omissions in these documents and reserves the right to make changes or improvements at any time. All United Design Associates Inc. Ideal Home PlansTM, Preview Sets and all other products and services are protected by United States Copyright Law and International Treaty Provisions. You may not modify, duplicate in any form, rent, lease, loan, distribute or create derivative works based on information provided in whole or in part. Any reproductions or modifications by means now known or hereafter invented, without the express written consent of United Design Associates, Inc. is strictly prohibited and will be prosecuted to the fullest extent of the law. Complete UDA Copyright Information. Copyright ©1996-2003 United Design Associates, Inc. All Rights Reserved.